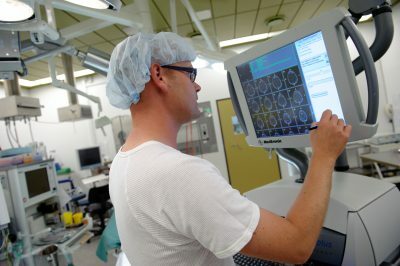 Odense University Hospital (OUH) gives high priority to research, and in collaboration with the Institute of Clinical Research at the University of Southern Denmark, the hospital has prepared an ambitious research strategy for the period 2016-2020; a strategy that replaces the previous strategy which went from 2012 – 2016. Both the ‘old’ and the new research strategy anticipate the New OUH and the integration with the University of Southern Denmark, which will provide new and interesting possibilities for increased collaboration on research. This unique collaboration between OUH and the University of Southern Denmark, in which research and clinics are linked directly to one another, creates optimal frameworks for translational research with benefits for patient treatment. The first centre will open at the end of 2012. DKK 14 million have been earmarked for each centre over a period of five years with the possibility of extension for another five years, including new DKK 14 million for each center. Head of center: Professor, Chief Physician, DR.Med, Lars Melholt Rasmussen. You can find more information about the idea of the center here or at ORCAs own homepage. You can find more information about the original idea of the center here. The center structure is under revision since a new Steno Diabetes Centre Odense was established January 1 2018. You can find more information about the center at AgeCares homepage.